Updates from Yangon, Burma. Clowns Without Borders project. 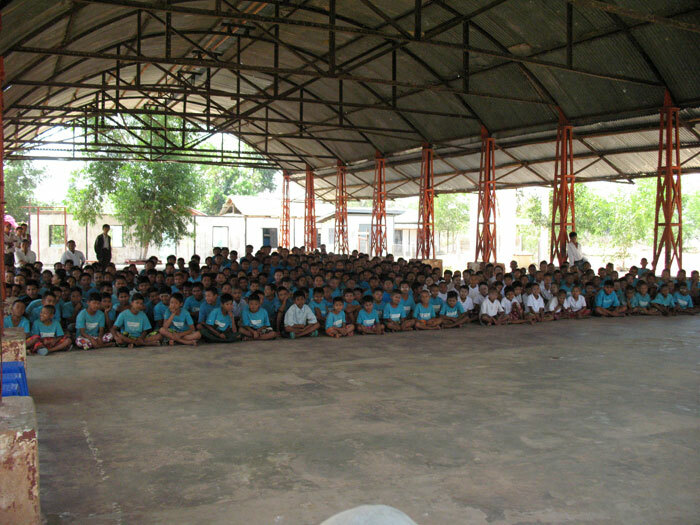 Background Children’s Training Schools in Myanmar are state run institutions that house children whom have been arrested by the state and placed in detention. These children are orphans, street kids, children ‘in conflict’ with the law ranging in age from 7 to 18. These children, for the most part, do not have freedom of movement, or access to artistic and creative activities. Week 2 Offer workshops to the children in each of the 4 training schools, training actors to teach workshops in the schools. An airplane ride this afternoon will take me out of the dusty heat of Yangon into the polished aluminum modernity of the Singapore airport and onwards towards Europe and privileged ways of life. This last week, we returned to all the Yangon Children’s Training Schools to offer workshops. The children welcomed our return with grinning smiles, and dived into the exercises opening up a lot of fun, laughter, focused play and great times. Our plan, to bring artistic and creative activities into the Training Schools where there are none, proved to be a big success. We worked with 30 children at a time, and with five of us teaching: Su Su, Thè Thè, May, Soe, from Thukhuma Khayeethe and myself. I was introducing workshop techniques that I have used frequently to the Burmese artists. Using the clowning to offer an opportunity to the children to open up personal expression, and to release a bit of their daily tensions. The workshops offered them moments to play important and powerful, as well as chance play frustration, and sometimes fear. I only wished that we could accommodate more children in a workshop as most schools have more children than we could fit into the time allotted. The children had a great time as they explored their creative zone. We often went over our hour-long plan. Asking the children what they liked about the show, and if they like the idea of being funny was a nice way to invite them into the workshop activities. After a little warm-up, a few focus exercises we explored deep voice and the idea of doing something funny. We explored a bit of mime, starting with the venerable fixed point-your hand doesn’t move but your body does (hint: bend your elbow.) It was a great way to introduce elements of the show that the children said they want to try-the moment when we ran into the invisible wall, the tug of war with the invisible rope. There was a recurring focus on playing their funny where many children found their delight.. A lot of gleeful smiles went along with great moments of focus and concentration, and other moments where exploring their funny, the children came up with great imaginative improvisations. We worked with 30 children at a time, and with five of us teaching: Su Su, Thè Thè, May, Soe, from Thukhuma Khayeethe and myself. I was introducing workshop techiniques that I have used frequently to the Burmese artists. Using the clowning to offer an opportunity to the children to open up personal expression, and to release a bit of their daily tensions. The workshops offered them moments to play important and powerful, as well as chance play frustration, and sometimes fear. I only wished that we could accommodate more children in a workshop as most schools have more children than we could fit into the time allotted. Our last school visit, Kyeike Wine, was a little more difficult. We worked with older boys, and they clearly were not as interested in the funny as we were. As I started to witness a disconnect in the first session, I realized that we hadn’t quite thought out the workshop plan well enough. Adolescent boys, especially this tough crowd, were not interested in being funny. So I quickly switched gears, and started teaching them to juggle, improvising in the moment using small rocks as juggling balls. Now this was interesting, at least for about 7 minutes, and when I started to see signs of disconnect, I launched plan B, which was to have Su Su and Thè Thè, launch into several simple acrobatic duo holds. I was glad to see a number of children so interested in trying to juggle that they ignored the change of focus and continued their juggling. Thukhuma Khayeethe will continue to visit the schools to offer workshops to the children. CWB-USA is funding the next two months of workshops, AND, if you feel so inclined to help support this effort, you can donate funds to CWB, and specify that you would like them to be used for the Burma Project. The first thing I hear at Nget Awe San Children’s Training School are young male militaristic call and response voices. It is only after our show for some 450 boys, almost all in identical blue t-shirts that I clearly understand the nature of the voices. The boys have assembled into orderly groups, one boy heading each group, calling out to them as they respond in unison before leaving the large open-air pavilion in orderly rows, arms either swinging, or crossed across their chest. They leave behind a generous heaping of echoes of laughter as indeed they have a great time during our performance. It’s extremely hot in this rather arid section of the country where the main activity I am told is harvesting bamboo, though I do see, as we travel the last half hour over a dusty red earth road, quite a few rubber tree expanses. One thing is for sure, during the last 3 days, the children have been laughing a lot. We have done six shows now, in 4 training schools, a woman’s vocational school, and a foster home that houses former street children. The kids are having a great time, loving the injection of humor into these institutions I have been working with five artists from Thukhuma Khayeethe (Arts Travelers), the local theater group who have been collaborating with the French and Swedish Clowns Without Borders groups. We have been working hard, though we joke about it being soft work, as indeed it is compared to the normal livelihoods in Burma, but there certainly hasn’t been any lack of effort, dedication and results. We started with four days of workshops and creation focusing mainly on clown technique and developing one’s personal clown. Working with 6 paper shopping bags (courtesy of rainbow grocery and whole foods), some elementary mime, a hint of acrobatics, juggling and magic, we have concocted an hour-long show that is quite full of the funny, and the children have been loving our offerings. The situation in some of the schools is better than others. In a few of them, there is certainly a sense of daily difficulty, and in others, the children seem better off. A couple of times, there has been a need to break through an invisible wall to reach the children’s funny bones, but once it opens, a lot of delight is in the air. The trip out to the Nget Awe San training school was particularly memorable. Not only is it our biggest show (450 boys), but also the school is located in the election district where Aung San Suu Kyi is running for parliament so we there were NLD stands and posters along the way. It is such a contrast to when I was here two years ago, and no one would even dare say her name out loud for fear of being thrown in jail. My two weeks here is part of a longer 3-year project with the Swedish and French CWB’s to increase Thukhuma Khayeethe’s capacities in clown performance and teaching abilities. There has been great progress in the actor’s clowning abilities this past week. That I can give feedback after each show has allowed the actors to really develop, as the best teacher in clowning is the audience. The show includes quite a bit of group clowning as well as three duos: Than and May do a professor’s nightmare rope magic routine, SuSu and TheThe have developed a routine around some very simple acrobatics, and Soe Mya Thu and I with a juggling routine involving balls and rings. It is wonderful to witness the laughter in these schools where the children don’t necessarily get to have such a good time. I am looking forward to the week ahead when we will return to all the schools to offer workshops to many of the children. I will again be training the Thukhama Khayeethe actors as we go along, this time in how to teach workshops, focusing especially on using clowning exercises to release pent up tensions, and emotional energies through humorous expression. I have just completed 4 days of workshop and show creation with Thukhama Khayeethe, and tomorrow we take the show on the road into the Children’s Training schools-6 shows in the next 3 days. These schools are really institutions for children at the margins of the Burmese society, street kids, orphans and kids in ‘conflict with the law’, that the government has placed in these schools. The work has been great, and the actors are quickly developing their clowning capacities. The show is bringing humor into skills they already have developed in acrobatics, magic and juggling, as well as improvisations around character relationships and mime that I have been introducing–so looking forward to seeing the smiles on the children’s faces. Next week we will plunge into offering workshops in the training schools, and developing Thukhama Khayeethe’s teaching skills. As one might expect, there is a great sense of teamwork and fun that pervades the time we are spending together, and no doubt we will be sharing that with the children.